We have various activities other than business activities such as photographing and production related area. They are for introducing and development of time lapse technology in Japan. We are holding lectures and training sessions, as well as to support the essential software for time lapse processing, i.e., LRTimelapse for its sales and technical support. In case you need the lectures or training sessions, please do not hesitate to contact us for adjustment of the cost depending on the number of participants and content. As for the support of the LRTimelapse, please click on the "Sale of Equipment" button of the menu to move to the "SKYPIX Dolly Plaza", and there you'll find the relative pages. 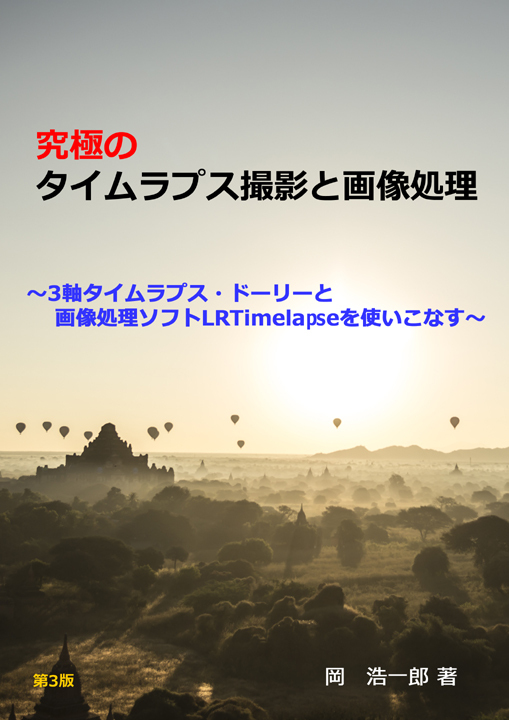 12 Published a printed book titled "The ultimate Time lapse shooting and image processing --Master how to use 3 axis time lapse dolly and the software LRTimelapse --" 1/4/2019 (160pages, Price:JPY3,000) The ultimate Time lapse guide book. Available at AMAZON or SKYPIX JAPAN Website. As one of the activities that I could contribute to the development of the Timelapse world, we made a series of tutorial videos in Japanese for LRTimelapse4, which is a revolutionary timelapse processing software that is developed by a German photographer, Mr. Gunther Wegner, so that I could introduce it to all the Japanese timelapse aficionados. BASIC edition (（Part1 - Part3), Holy Grail edition, and qDslrDashboard edition compose all the series in five video files. LRTimelpase4 is a software that processes ugly sequence which is taken under large and consecutive variation of the light in the dawn or twilight into a smooth movie. Especially, for the sequence from the twilight to the starry sky, or starry sky to the dawn, a Holy Grail technique is used to shoot, which requires the consecutive change of camera settings, but it has been believed that processing it into a smooth movie is impossible for a long time. This is a tutorial video of the software, LRTimelpase4 that enables us to resolve this problem completely. In the qDslrDashboard edition, which is the last edition of the series, a software that realized an automatic shooting of complicated Holy Grail, is introduced, so that people can utilize LRTimelapse4 for 150%. We certainly hope that our little effort could be of any help for those who love a timelapse shooting. 2. 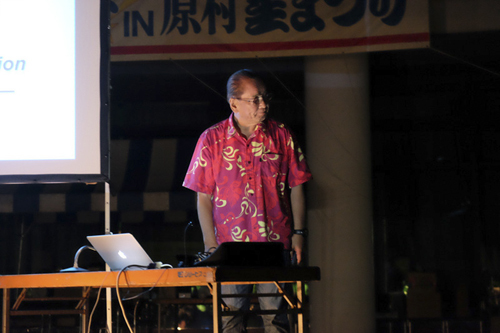 Lecture on "Shooting & Processing Timelapse - Night Sky Motion Timelapse"
We gave a lecture to show various know-hows at "Haramura Star Festival" held at Yatsugatake Nature Cultural Park on August 8th, 2015. One of the main theme is to show how the motion timelapse is taken, and it is focused on Night Sky Motion Timelapse. In a limited time for 45minutes, technical talks are included as much as the time permits. 3. 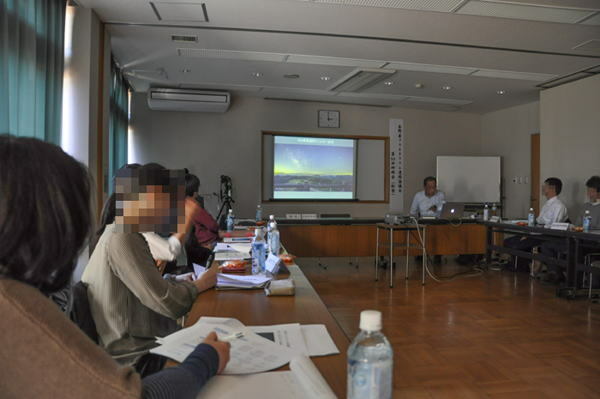 Training session on "Shooting & Processing Timelapse - Night Sky Motion Timelapse"
We gave a lecture to show various know-hows at a training session for "Nagano prefecture Planetarium Liaison Conference" held at Yatsugatake Nature Cultural Park on November 4th, 2015. The timelapse is expected to be used as a new show program in the planetarium, and I was requested to to give a lecture. Beautiful timelapse movies were introduced as well, as much as the time was left, so that people could enjoy to learn about timelapse. 4. 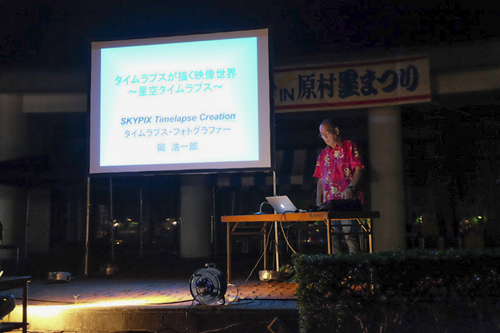 Lecture on "The World of Starry sky by Timelapse"
We gave a simple lecture to introduce beautiful timelapse movies even for family groups and lovers using most of time for showing them sample timelapse movies,at "Haramura Star Festival" held at Yatsugatake Nature Cultural Park from August 5th to 7th, 2016. 5. 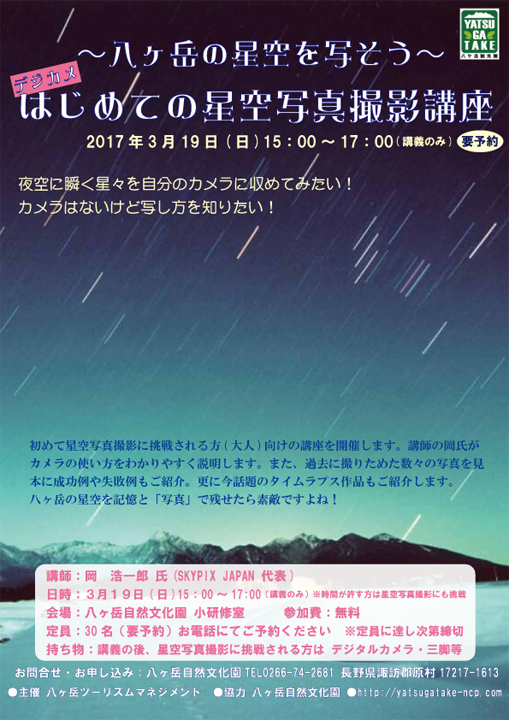 Training session on "The first step to shoot the Starry photography"
A lecture for beginners to introduce how to take starry photography at Yatsugatake Nature Cultural Park on March 19th, 2017.. 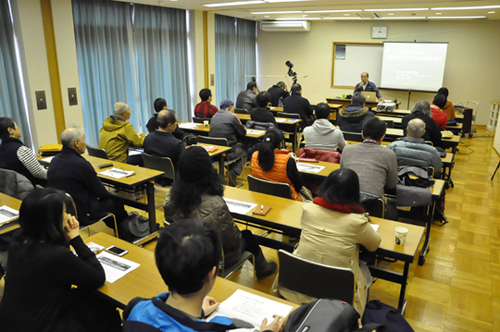 The variety of time lapse movies were also introduced, and all the participants were very much interested in. After the lecture, participants enjoyed a gathering for shooting stars in the field. 6. 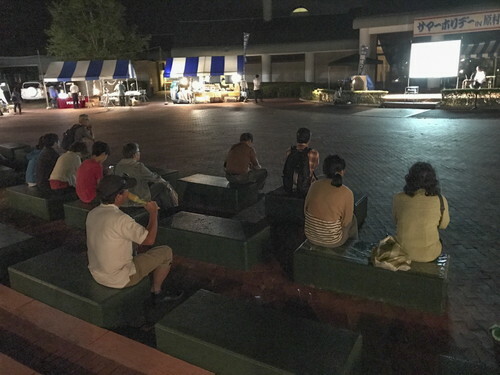 Lecture on "The World of Starry sky by Timelapse"
We gave a simple lecture to introduce beautiful timelapse movies even for family groups and lovers using most of time for showing them sample timelapse movies,at "Haramura Star Festival" held at Yatsugatake Nature Cultural Park from August 4th to 7th, 2017. 7. 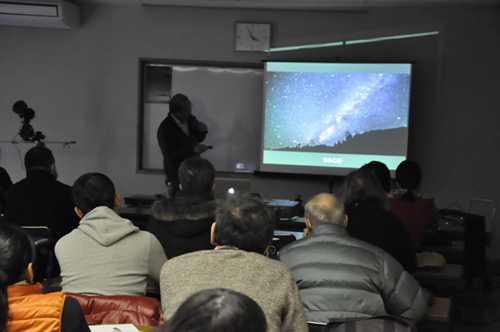 Lecture on "Starry sky time lapse shooting using a motion equipment!" 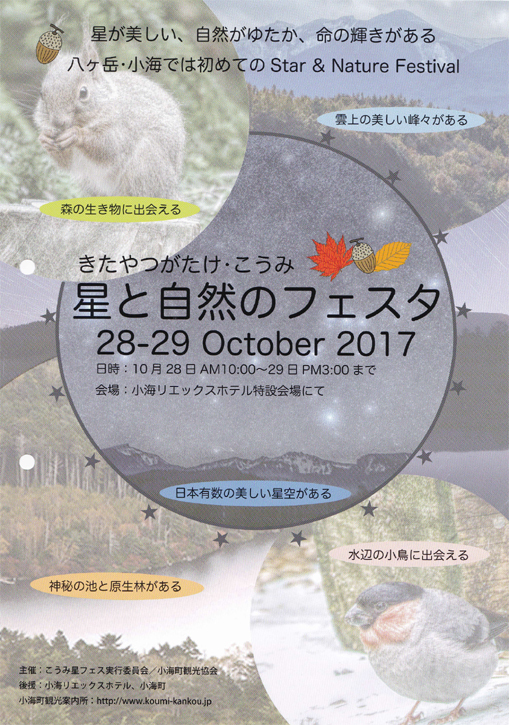 We gave a lecture regarding the technique of shooting starry sky time lapse using motion equipment, introducing many relative time lapse works in "2017 Star and Nature Festa in Komi, North Yatsugatake" on October 28-29, 2017. The LRTimelapse4, the software to process the time lapse sequence, which is used widely among the time lapse photographer in all over the world, has been up graded to LRTimelapse5. We made and publish the reference video to introduce its new functions. 9. 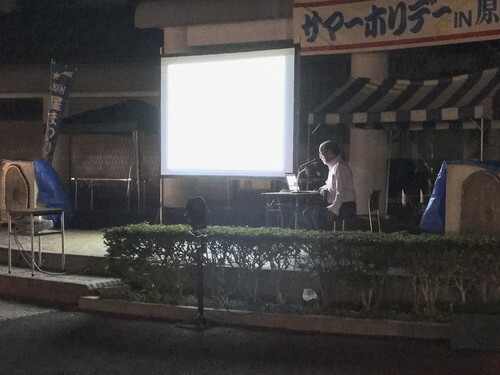 Lecture on "The World of Starry sky by Timelapse"
We gave a simple lecture to introduce beautiful timelapse movies even for family groups and lovers using most of time for showing them sample timelapse movies,at "Haramura Star Festival" held at Yatsugatake Nature Cultural Park from August 3rd to 5th, 2018. 11. Published an e-book titled "The ultimate Time lapse shooting and image processing -- Master how to use 3 axis time lapse dolly and the software LRTimelapse --"
12. 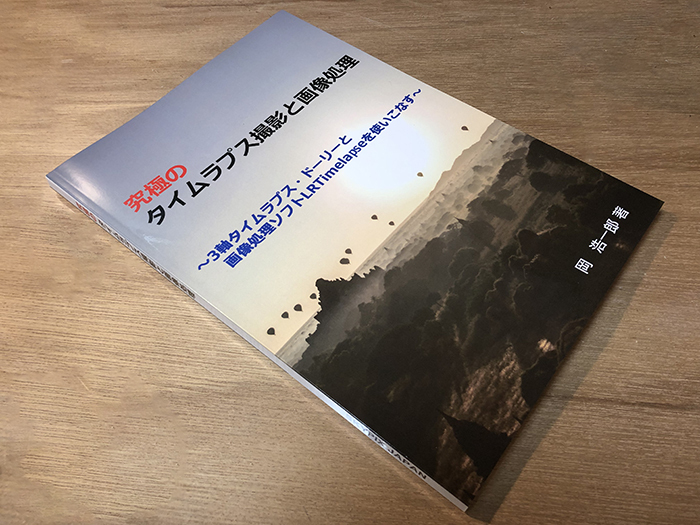 Published an printed book titled "The ultimate Time lapse shooting and image processing -- Master how to use 3 axis time lapse dolly and the software LRTimelapse --"